← Gay Marriages Today, Polygamy Tomorrow? 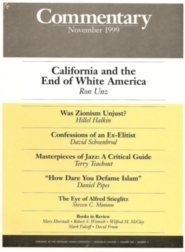 Californians of European ancestry—“whites”—became a minority near the end of the 1980s, and this unprecedented ethnic transformation is probably responsible for the rise of a series of ethnically-charged political issues such as immigration, affirmative action, and bilingual education, as seen in Propositions 187, 209, and 227. Since America as a whole is undergoing the same ethnic transformation delayed by a few decades, the experience of these controversial campaigns tells us much about the future of our country on these ethnic issues. At some unknown date during the late 1980’s, and with no attention paid whatsoever, whites became a minority in California. The silence surrounding this momentous event, without precedent in American history, is quite understandable. It was the late Reagan era, a time of economic boom and the approaching end of the cold war, and racial issues had temporarily receded from visibility. Then, too, California enjoyed a reputation as being among our most cosmopolitan, open, and optimistic states, better known for its flourishing economy and hippies and beaches than for racial conflict; this reputation had been confirmed in 1982 when the nation’s largest state came within a hair’s-breadth of electing Tom Bradley as America’s first black governor. Besides, on the historic transition date in question, official statistics would have indicated a shrinking but still substantial white majority. The bizarre framework of federal racial classification–which divides all mankind into Asians, blacks, Hispanics, and “other” whites–places blond, blue-eyed, third-generation Argentinian-Americans who speak not a word of Spanish in the category of minorities, while dark-skinned Muslim immigrants from Egypt, speaking not a word of English, are labeled members of the white majority. In this Alice-in-Wonderland perspective, the huge inflow into California of hundreds of thousands of Iranians and Armenians and Egyptians had acted to “whiten” the state, partially balancing the huge simultaneous inflow of Vietnamese and Mexicans and Somalis. But the irrationality of official statistics did not prevent Californians of European ancestry from recognizing that they were fast becoming a minority within their own state–and their unease about this situation would soon be reflected in the political landscape. During the 1994, 1996, and 1998 election cycles, three ballot measures with strong racial and ethnic overtones–Propositions 187 (illegal immigration), 209 (affirmative action), and 227 (bilingual education)–explosively probed the delicate fault lines of California’s new multiethnic society. Each of these widely popular initiatives drew far more media coverage and generated far greater emotion than did the candidates for statewide or national office who shared their same ballot. Taken as a whole, they are certain to loom large in any political history of late-20th-century America, long after those candidates have been forgotten. Because the three measures dealt with questions inevitable in an ethnically diverse society, examining the very different campaigns surrounding them can tell us much not only about California today but, since national demographic trends lag behind those of California by only a generation or two, about how our larger political world is likely to evolve as Americans of European ancestry fall increasingly into minority status during the first half of the new century. Two alternate futures present themselves–which might be labeled the new American melting pot and the coming of white nationalism–and the recent politics of California lends some plausibility to each. America’s continued viability as a nation may well depend upon which of these two paths we choose. UNTIL THE late 1960’s, California had probablyhad less experience with racial politics than most of America’s other large states. Its Asian community, although the nation’s largest, was still negligible in size and power, amounting to just 2 or 3 percent of the general population and lacking significant political influence. Hispanics had not yet been invented as an American racial group by federal bureaucrats, and so were perceived much like Italians, Arabs, or other darker Caucasians of marginal social status; in any case, their numbers were probably well under 10 percent of the state, with an economic profile ranging from the most prestigious landowning families to poor migrant farmworkers who crossed national borders without notice or concern. And as for blacks, America’s prototypical minority, few lived in California prior to World War II, and even afterward their numbers never rose above 7 percent, by far the lowest such proportion of any major state in the union. Thus, in 1970, government statistics would have described California as 90-percent white, and most Californians, on the basis of their own experience, probably would have concurred. Then, over the next decade and a half, some two million documented foreign immigrants–over a quarter of America’s total–entered the state, further augmented by a continuous flow of illegals and additional millions of foreign immigrants relocating from other states. By 1990, California’s Latino population had more than tripled; Asians had increased almost fivefold. Most of these immigrants were young, and often they came from societies where seven or eight children to a family were not uncommon. Although the cultural influence of their new American environment quickly reduced their typical family size to three or four children, the immigrant birthrate still far outpaced that of affluent whites, many of whom had anyway already passed their child-bearing years. This large difference in natural increase meant that, by 1991, California was recording more Hispanic than white births, despite an official white population more than twice as large; if immigrants officially classified as white were excluded from the total, the white/nonwhite ratio would have been more lopsided still. It was, inevitably, in the public schools that the earliest signs of ethnic transformation became visible to California’s middle class. Within just a few years, large urban school districts had shifted from overwhelmingly white to overwhelmingly minority, with many of the remaining “whites” actually being immigrants or their children. As early as the 1980’s, some 140 different languages were spoken in California schools. This made for a potentially dangerous situation, ripe for scapegoating. For even as the Latino and Asian populations were growing exponentially, California’s electorate remained overwhelmingly white. Immigrants, being younger and less affluent, with low rates of naturalization and few ties to public issues, mostly ignored the political process: although, by 1990, Latinos and Asians constituted some 40 percent of the state’s population, they were just 10 percent of its voters. This political vacuum permitted a small number of Left-liberal ethnic activists to stake an uncontested claim to represent the views of ordinary Asians and Latinos. Despite the fact that these activists, generally second- or third-generation Americans, had no real ties to the immigrant population, their shrill cultural and linguistic demands–often modeled on those of their black allies–regularly served to annoy and unnerve California’s white political majority. AND YET, until the early 1990’s, California’s rapidly transforming and potentially combustible society seemed to be leading a charmed life. Elderly whites might grumble at the vast number of “foreigners” everywhere; communities undergoing especially rapid ethnic succession might exhibit bouts of “English Only”-ism; white students at UCLA might jokingly refer to themselves as attending the “University of Caucasians Lost among Asians.” But all in all, ethnic tensions seemed surprisingly minimal. One helpful factor here was California’s ongoing economic boom, fueled by the massive Reagan defense buildup, which provided jobs for everyone from white aerospace engineers to Mexican construction laborers. The powerful agribusiness lobby, heavily dependent on undocumented farm labor, also exerted enormous influence in state politics, ensuring that moderate pro-business leaders like then-Senator Pete Wilson hewed to a position of de-facto support for high levels of illegal immigration. And it was not just moderate Republicans like Wilson who held pro-immigrant views; so, too, contrary to stereotype, did many prominent conservatives. The entrepreneurship and economic dynamism of most immigrants, the strong family values and Catholic faith of Latinos, the fierce anti-Communism of Cuban and Vietnamese refugees–these did not go unnoticed during the Reagan era. In 1984, during the heated debate over the Simpson-Mazzoli Immigration Act, none other than right-winger Patrick J. Buchanan had denounced the proposed legislation as mean-spirited toward hard-working illegal immigrants, and as late as the 1990 publication of his conservative call-to-arms, Right from the Beginning, Buchanan was still casually referring to illegal immigrants (let alone to legal ones) as stalwarts of American optimism and economic advancement. Fiery Bob Dornan had originally unseated a Democratic incumbent in his Orange County congressional district thanks to a local influx of anti-Communist Vietnamese refugees, and his unbending anti-abortionism regularly won him many Latino votes; in his appearances on Rush Limbaugh’s radio show, Dornan scathingly denounced anti-immigrant activists. If the Right could find little fault with immigrants during this period, liberals and the Left often showed greater hostility. Environmentalists pushing for slow-growth economic measures often locked horns with Latino (and black) elected officials from working-class districts where the paramount issue was jobs rather than “quality of life”; the Federation for American Immigration Reform (FAIR), America’s premier anti-immigration lobby, had been founded in 1978 by radical environmentalists. In another sector of the liberal universe, unionized white workers found themselves being priced out of the market by increasingly skilled immigrants. Even Cesar Chavez’s United Farm Workers urged a crackdown on Latino illegal immigrants. But the main source of conflict, especially in the Los Angeles metropolitan area, was friction between immigrants and blacks. During the 1980’s, as large numbers of Mexicans and Central Americans began displacing blacks from their traditional neighborhoods, the competition for housing, jobs, and political power became fierce. At the same time, Asian shopkeepers, primarily Koreans, had begun to dominate small-scale commerce in black neighborhoods, replacing previous (usually nonblack) owners or reopening abandoned properties. Such changes were natural, even beneficial; but, at a moment when high unemployment and the growing impact of the crack epidemic had produced considerable racial xenophobia among blacks, they generated severe resentments. THE EFFECT of the 1992 riots on California’s ethnic politics cannot be exaggerated. Although few white neighborhoods were directly threatened and fewer whites were killed or injured, the plumes of smoke from burning buildings and the gruesome television footage almost completely shattered the sense of security of middle-class Southern Californians. Suddenly, the happy “multicultural California” so beloved of local boosters had been unmasked as a harsh, dangerous third-world dystopia. Scenes of Uzi-toting Korean shopkeepers exchanging fire with shadowy rioters made even California’s so-called “model minority” seem alien and threatening. And the large numbers of Latinos arrested (and often summarily deported) for looting caused whites to cast a newly wary eye on gardeners and nannies who just weeks earlier had seemed so pleasant and reliable. If multicultural Los Angeles had exploded into sudden chaos, what security could whites expect as a minority in an increasingly nonwhite California? The often divisive rhetoric of self-appointed ethnic activists hardly provided comfort. Other factors, too, contributed to the tension. The end of the cold war and the resulting defense build-down had led to a deep recession in early-1990’s California, and the shrinking economic pie produced a sense of statewide despair. For many whites, this economic decline came to be symbolized by the images of unemployed Latino laborers–large numbers of them undocumented–who gathered in small knots each morning at suburban street corners, hoping for contractors to give them a day’s work. A twenty-year real-estate bubble had also burst, and aging suburbanites, now thinking of relocating elsewhere, were suddenly faced with the reality that their homes–their principal financial asset–were worth only a fraction of what they had been a few years earlier. Orange County, just south of Los Angeles, had originally grown to maturity as a leading receptacle of earlier white flight; now several of its own larger cities like Santa Ana and Anaheim had suddenly become heavily populated by immigrant Latinos and were increasingly poor. Terrified of social decay and violence, and trapped by collapsed property values, many whites felt they could neither run nor hide. Under these circumstances, attention inevitably began to focus on the tidal force of foreign immigration. THE FIRST California political figure to raise the immigration issue was Tom Houston, a liberal Democrat from Los Angeles who had served as deputy mayor under Tom Bradley and was now attempting to succeed his ex-boss. From late 1992 through the primary election in the spring of 1993, Houston focused relentlessly on the fiscal and social threat posed by illegal aliens, ranging from the increased burden on the city’s social-welfare system to crime and gang violence. Although Houston lost, his positions generated strong populist support and attracted major media coverage. Moreover, his ideological credentials as a liberal Democrat provided cover for others eager to raise the same issue but fearful of being branded “racist.” Within months of the mayoral race, a whole raft of immigration-related measures had been introduced into the state legislature, and top-ranking politicians, presumably driven by polls and focus groups, were eagerly presenting their sound-bites on the local evening news. Senator Barbara Boxer, a Left-liberal Democrat, urged the construction of a border fence with Mexico, to be manned by California’s National Guard; Senator Dianne Feinstein, a moderate Democrat, advocated a huge increase in the border patrol; and Pete Wilson, California’s moderate Republican governor, proposed denying U.S. citizenship to the American-born children of illegal immigrants. Wilson’s main innovation was to frame the issue as one of fiscal responsibility: he argued that the cost of providing government services to illegal immigrants was prohibitive. This had some plausibility, since most such immigrants were poor and the taxes they paid probably did not cover the cost of the education their children received in the public schools–though the same could be said of all lower-income residents, immigrant and nonimmigrant alike. But other claims advanced by Wilson–that, for instance, California’s generous welfare arrangements served as a magnet to impoverished foreigners–were false and demagogic: nearly all immigrants came for jobs, not welfare. Plausible or not, the governor’s charges resonated widely among California’s recession-plagued white electorate. Despite clear visual and personal evidence that Latinos and other immigrants were enormously hard-working and filled every available job niche of the California economy, the common white stereotype of darker-skinned peoples as especially prone to government dependency proved irresistible. “Stopping welfare for illegal immigrants” became a powerful slogan. The results were immediate. Wilson, whose popularity during the recession had plumbed all-time lows, saw his approval rating shoot up almost overnight. Because his initial targets were illegal immigrants, pro-immigrant politicians such as members of the state’s Latino caucus were trapped between the difficulty of defending illegality and the embarrassment of falling silent before Wilson’s attacks upon portions of their own community. By late 1993, illegal immigration seemed to have established itself, alongside crime and education, as a major potential issue in the 1994 statewide elections. The sharp distinction between illegal and legal immigrants would become a standard tag line of nearly all political rhetoric during the immigration wars of the next two or three years, both in California and around the nation. Wilson’s own exceptionally effective campaign ads featured gritty black-and-white footage of illegal aliens scurrying across the Mexican border like an army of subhuman invaders, but then balanced this harsh image with reverent shots of the Statue of Liberty and of legal Latino residents taking the oath of U.S. citizenship. Pro-immigrant groups merely provided different body language for the same basic message: legal immigrants good, illegal immigrants bad. The history of immigration policy added another layer of complication, not to say irony. Legislation championed by then-Senator Wilson in 1986 had granted amnesty to some three million illegal immigrants, the bulk of them residents of California. Thus, by 1994, a significant fraction of California’s “good” legal immigrants had only recently been “bad” illegal immigrants, having been transformed by a stroke of the pen. And this amnesty led to still further complications, since many newly legalized Mexican workers had subsequently brought their wives and children to live with them, generating a maze of intermingled relationships: in a typical immigrant household the husband might be an amnestied legal resident, the wife and older children illegals, and the younger children native-born American citizens. BUT ALL such details and nuances were to be submerged completely as California’s 1994 election campaign eventually became a massive referendum on the single subject of illegal immigration. In the spring of that year, a fringe group of anti-immigrant activists led by a failed accountant named Ron Prince had quietly begun to gather signatures to qualify the “Save Our State” (SOS) voter initiative for the November ballot. Under its later, official designation as Proposition 187, the measure became a watershed event in the national politics of race. The initiative banned all nonemergency government services for illegal immigrants and their children–a simple and reasonable-sounding proposal until one realized that it would force the immediate expulsion of hundreds of thousands of immigrant children from public schools throughout California. In one draconian clause, the measure stipulated that mothers who attempted to use false documents to keep their children in school would receive mandatory five-year prison sentences; in another, it required teachers and doctors to report immediately to the INS any individuals they “suspected” of being illegal immigrants, thus raising the specter of a wave of ethnic witch-hunts. Reflecting its grassroots origins, the measure was poorly drafted and highly ambiguous, and was written in explicit defiance of a 1982 U.S. Supreme Court decision, Plyler v. Doe, requiring public education for all children, documented or otherwise. None of these seemingly fatal flaws lessened the overwhelming popularity of Proposition 187, which represented to most voters a revolt against a governing elite whose economic and social policies had brought the Golden State to its knees. Although initially skeptical, Wilson gradually embraced the proposal, ultimately making it the centerpiece of his own reelection campaign–so much so that by election day, according to some polls, more voters were aware that Wilson supported 187 than that he was the state’s incumbent governor or much of anything else about him. The campaign itself was exceptionally divisive, among the most bitter in the state’s history. With even California’s “moderate” governor calling for the expulsion of 300,000 children from California schools, implicit sanction was given to far more extreme words and deeds. At one point, Proposition 187 chairman Ron Prince told an audience of conservative activists that “you are the posse and SOS is the rope,” while others regularly declared that the measure would finally drive the encroaching hordes of illegal aliens back to Mexico. Among immigrant families ignorant of American law, frightening rumors spread that the initiative authorized physical attacks on the undocumented, a perception reinforced by the unfortunate coincidence that “187” was also American police code for “homicide.” The suggestion of a popular conservative talk-show host that the state offer a cash bounty for each “illegal immigrant” shot proved that such anxieties were not entirely unfounded. Unwise or provocative behavior by anti-187 groups fed in turn both fear and backlash among whites. In October 1994, a coalition of grassroots pro-immigrant groups led a protest march and rally of 70,000 mostly immigrant Latinos through Los Angeles, perhaps the largest political demonstration in California history. Although the event was entirely peaceful, many of the marchers carried flags from their various Latin American countries of origin, and the images of that sea of foreign flags in downtown Los Angeles, endlessly reprinted and retelevised, seemed to confirm the worst suspicions of white Californians that they were losing control of their state to unassimilable aliens. Coming just three weeks before the election, the heavily covered march guaranteed the initiative’s passage. THE SWEEPING 59-percent victory of Proposition 187 in November 1994 represented a political earthquake. Not only did its coattails carry Governor Wilson–who before he embraced the measure had been the most unpopular incumbent in California history–to a lesser landslide of his own, but Republicans gained a majority in the state assembly for the first time in three decades and picked up four seats in California’s congressional delegation. The very fact that the highly flawed initiative had triumphed in the face of universal opposition by the state’s editorial boards–and condemnation by many prominent national conservatives like Jack Kemp and William J. Bennett–only heightened the impact. Success succeeds, and California Republicans believed that they had found a magic formula for long-term political realignment. Nor were Republicans alone in drawing such conclusions. Senator Dianne Feinstein, California’s most prominent Democrat, had herself effectively used the immigration issue to survive a surprisingly strong challenge by her opponent Michael Huffington; in content and style, her campaign’s television barrage of immigration ads had been almost indistinguishable from Pete Wilson’s. Although Feinstein did ultimately declare herself against Proposition 187, her opposition was grudging and late, and following the measure’s triumph she immediately repositioned herself as the national champion of massive cuts in legal immigration, hoping to outflank Wilson and the Republicans on that emerging front. Against illegals, she also proposed the immediate introduction of a mandatory National Identity Card, together with the annual fingerprinting of every man, woman, and child in America. As for Bill Clinton, who read the same election returns and the same polls, he soon declared his support for sweeping “immigration-reform” legislation in Congress, featuring the most drastic cuts in entry numbers since 1924. EVEN AS national political leaders were digesting the sudden prominence of the immigration issue, a second ethnically-charged initiative entered upon the California stage. For several years, two obscure academics had been trying to attract interest in their proposed measure banning governmental affirmative action, but without success or visibility. Now, in the wake of Proposition 187 and its national impact, the me dia had begun to recognize the political potential of proposals from such unlikely sources, and by the early months of 1995, the so-called “California Civil Rights Initiative,” targeted for the 1996 ballot, was being widely hailed as the next big thing in California and the hottest of national hot-button issues. According to early media accounts, fearful and angry whites, the driving force behind Proposition 187 and the national Republican sweep in 1994, had found a new and hardly surprising goal: ending the entrenched system of racial discrimination against white people known as affirmative action. Initial polling figures on the proposed measure, later designated Proposition 209, indicated the expected high levels of support among white Californians. More startlingly, they also revealed almost equally strong support among both Asians and Hispanics, and a near-even split among blacks, historically the group that benefited the most from affirmative action. Gun-shy Democratic leaders, previously unshakable in their support of these controversial programs, now viewed the initiative as an unstoppable political freight train, to be avoided rather than directly opposed. Even Willie Brown, California’s long-time Democratic Speaker of the Assembly and perhaps America’s most powerful black elected official, began to consider support for an effort to place the measure on the June 1996 primary ballot so as to prevent it from being used as a November general-election issue against Democrats. Senator Feinstein’s campaign chairman endorsed the initiative and began negotiating with its backers over the prominence of Feinstein’s role in the eventual campaign. And on the national stage, President Clinton announced the formation of a commission to review affirmative action, a move widely seen as providing him with the necessary political cover to reverse his longstanding position and abandon the now-controversial policy. After 30 years of apparent inviolability, America’s system of affirmative action appeared–like Communism–on the verge of collapsing without even a fight. In California, as elsewhere, governmental affirmative-action programs were seen as being of little interest to nonblack minorities like Latinos or Asians, few of whom worked in the public sector. Indeed, as the attack on these programs began, some Latino leaders, expressing their anger at the scanty black support they had received during the Proposition 187 campaign, indicated that they might return the favor by sitting on their hands during the fight to come. As for Asians, they–even more than whites–had been denied opportunities by ethnic-preference programs; the explicitly restrictive quota on Chinese students at San Francisco’s elite Lowell High School had been an Asian-American cause célèbre for several years. Thus, at first glance, the alignment of interest groups reinforced the polls in suggesting that no clear white-versus-nonwhite divide would be found on this issue. Little wonder, then, that at this stage, Proposition 209 struck some observers as a potential counterweight to Proposition 187. Perhaps–the reasoning went–if the anti-immigrant elements behind Proposition 187 could be kept at a distance, it would be possible to win a strong mandate across all ethnic lines for the elimination of ethnic favoritism. Even where immigration was concerned, extensive private polling had indicated that the primary factor in white hostility was less the fact of immigration itself than balkanizing policies such as affirmative action, bilingual education, and multiculturalism, all of which were (rightly) seen as blocking traditional patterns of assimilation; remove the policies, and the hostility evaporated. And now, one of the most pernicious of those policies appeared about to fall before an amazingly broad ethnic coalition. Its demise could defuse white anger, allay nonwhite fears, and reaffirm the tradition of American pluralism. BUT IT was not to be. Governor Wilson, triumphant from his reelection sweep and now exploring a presidential race, decided to add opposition to affirmative action to his portfolio of national issues, where it would help balance his otherwise “liberal” positions on abortion, gun control, and gay rights. Although, as recently as December 1994, Wilson had reaffirmed his decades-long support for minority preferences, by February 1995 he was promising a national crusade to reestablish equality of opportunity under the law. With the encouragement of Ward Connerly, a black supporter whom he had appointed to the governing board of the University of California, Wilson began a lobbying campaign to persuade the university’s regents to end ethnic preferences in admissions immediately. Wilson’s entrance into the battle provided a tactical boost, but it led to a strategic calamity. Because of 187, immigrants, Latinos in particular, viewed him as a demonic force, and 209, instead of being perceived as an antidote to 187, quickly became transformed in their eyes into its anointed successor. In addition, what had looked at first like a nonpartisan movement to abolish an unfair system was now taking on the appearance of a cog in a poll-driven presidential campaign, with Wilson’s own about-face being seen as an exceptionally cynical move. When the Wilson presidential bid collapsed, as it rapidly did, foes of the initiative took heart, the more so since its supporters were showing an obvious lack of unity, competence, or significant financial resources. Any hope of enlisting prominent Democrats in the campaign evaporated. The Republican party now stepped in, rescuing the campaign financially while assuming complete control, and installed Connerly as its public face. Despite the latter’s efforts to prevent the measure from appearing narrowly partisan, the Proposition 209 effort soon became largely a get-out-the-vote adjunct to the 1996 campaigns of Bob Dole and other GOP candidates. This proved disastrous. Blue-collar Reagan Democrats, among the strongest foes of racial preferences, abandoned the measure in droves. With extraordinary obtuseness, Republican television spots directly linked Proposition 209 with Proposition 187, leading to a precipitous drop in Latino and even Asian backing. For nearly two years, polls had shown Latino support matching that of whites; in the wake of the Republican media campaign, Latinos ultimately voted against the measure even more strongly than did blacks. Proposition 209 failed even to carry a majority of Asians, the group with the most to gain from ending quotas in university admissions. In the end, 209 did win, but by a mere eight-point margin, just a quarter of what earlier polls had predicted. Moreover, from a narrowly Republican perspective, the measure failed in its primary duty of pulling party candidates to victory. On the contrary, from Dole on down, the GOP suffered a series of crushing defeats throughout California. Chagrined Republicans now concluded that the whole idea of ending affirmative action had energized the opposing base of minority voters much more than the supporting base of white conservatives. Instead of blaming their own tactics, they instead began to backtrack on the issue itself as much and as far as was quietly possible, figuring that so racially-charged a topic was just too risky to exploit effectively. Since most Republicans had never been comfortable dealing with these matters in the first place, the decision came easily enough. But the most unfortunate consequence of the final vote was precisely the impression it conveyed of ethnic polarization. California’s whites had overwhel mingly voted one way, its nonwhites overwhelmingly the other. Many opponents of immigration now cited this fact as proof that the interests of minorities inevitably diverged from those of whites, with no common ground possible. To more extreme voices, the victory of numerous Latino candidates in the 1996 elections signaled that California had been lost to America, and that a Latino secessionist movement–foreshadowing the eventual splintering of the country at large–was already visible on the horizon. INTO THIS heated landscape now entered the last of the three ballot measures, Proposition 227, aimed at dismantling bilingual education but propelled from an unexpected quarter. During 1996, as political attention focused on the presidential contest and Proposition 209, a small group of Latino immigrant parents in downtown Los Angeles, frustrated that their children were not being taught English–in practice, “bilingual education” in California meant Spanish-only instruction–began a public boycott of their local elementary school. With the help of a media-savvy Episcopal priest and longtime immigrant-rights activist named Alice Callaghan, the boycott attracted considerable coverage, gaining the support of Los Angeles Mayor Richard Riordan and eventually forcing the school district to capitulate and move the students to English classes. The matter seemed closed, but it was not. At this point, the story of Proposition 227 merges with my own, and thus requires a brief digression. My political activities in California had extended back a few years, beginning with a decision to challenge Pete Wilson for renomination in the Republican gubernatorial primary of 1994; running on a pro-immigrant and anti-affirmative-action platform, I won 34 percent of the vote. In that same year, I played a prominent role in the (unsuccessful) campaign to defeat Proposition 187 and, after that, in the (more successful) effort to block anti-immigration legislation in Congress. I had also hoped to involve myself heavily in Proposition 209, but was understandably rejected once Wilson’s operatives gained influence in the effort. As a strong believer in American assimilationism, I had long had an interest in bilingual education. Inspired in part by the example of my own mother, who was born in Los Angeles into a Yiddish-speaking immigrant home but had quickly and easily learned English as a young child, I had never understood why children were being kept for years–sometimes many years–in native-language classes, or why such programs had continued to exist and even expand after decades of obvious failure. The miserable record of bilingual education was evident from official statistics: a full quarter of all children in California public schools were classified as not knowing English, and 95 percent of these children failed to learn English in any given year. In fact, schools were paid extra for each child who did not know or had not learned English–a clear incentive for retaining them in a native-language program against all logic and against their parents’ wishes. The law authorizing this system had actually expired a decade earlier, but since the state government was deadlocked on the matter, bilingual education remained mandatory almost everywhere. Ending this failed and legally dubious program, which was now even forcing some parents to picket their own children’s schools, seemed the ideal target of a voter initiative, and I decided to make such an effort. In broad terms, my goal was to provide for the assimilationist approach to American ethnic diversity the same opportunity to demonstrate its appeal and popular support that Proposition 187 had provided, disastrously, for ethnic nationalists on all sides. Nothing could be more obvious than that immigrants themselves assigned enormous importance to learning English and to ensuring that their children learned English. Yet because of bilingual education, the completely opposite impression had been created, namely, that immigrants were ardently demanding that America’s public schools help maintain their family’s native language and culture. If executed properly, I believed, a campaign to eliminate these programs could attract substantial, perhaps overwhelming, support from immigrants themselves, thereby helping to puncture the mistaken anxieties of California’s white middle class. But I also recognized that in many respects the political climate was extraordinarily inopportune for such an effort. The ethnic wounds inflicted by 187 had been reopened by the destructive handling of 209, and for a Republican like myself to jump in with a proposal to dismantle the bilingual cornerstone of Latino public education was to risk a terrible explosion. In order to mitigate the risk, it was absolutely crucial that the ballot measure be properly perceived as being both pro-immigrant and politically nonpartisan. With regard to the former, my own pro-immigrant credentials provided some credibility, but not enough. So I began recruiting a cadre of key supporters: Alice Callaghan, with decades of unswerving left-wing activism on behalf of immigrants and their children; Gloria Matta Tuchman, a Latina and California’s most prominent anti-bilingual activist; and Jaime Escalante, of Stand and Deliver fame, perhaps America’s most renowned public-school teacher and himself a Latino immigrant long opposed to bilingual programs. But no less crucial was to avoid the deadly embrace of California’s numerous anti-immigrant activists, who were likely to jump immediately aboard such a campaign. Since their touchstone had become the elimination of public spending on immigrants, I drafted my own “English for the Children” measure to save no money but rather to appropriate an additional, if rather modest, $50 million a year for English-literacy programs aimed at adult immigrants. The maneuver succeeded, provoking the strong opposition of 187 activists to our entire initiative. THIS LEFT the various political establishments.For different reasons, both leading Latino and leading Republican figures maintained a stunned silence throughout most of the campaign. My meetings with the former were cordial; many Latino leaders seemed privately as skeptical of bilingual programs as I, but concerns about a revolt by their activist base prevented them from considering an endorsement, even after public polls consistently showed Latino support for the measure running in the 70- to 80-percent range. As for Republican leaders, they were terrified by the prospect of a minority-voter backlash of the sort their own ham-fisted campaign for 209 had provoked; despite nearly 90-percent Republican support in polls, they, too, mostly distanced themselves from the measure. Teachers’ unions were similarly conflicted. The late Albert Shanker, founder of the American Federation of Teachers, had for years been among the most vocal national critics of bilingual programs, but his successors had generally made their peace with the program. Most rank-and-file teachers, however, continued to view the system as a scandalous failure, and resented the extra pay and perks that went to bilingual instructors. In October 1997, over the strong opposition of union leadership, a grassroots referendum campaign in the gigantic Los Angeles local garnered 48 percent of the vote for a proposal making support for Proposition 227 official union policy. All these splits, so surprising to journalists, were extremely helpful to our campaign. When Proposition 227 first appeared on the scene, it seemed almost certain to be perceived as “Son of Proposition 187″–another test of raw political power between California whites and Latinos. Instead, the story we emphasized was one that pitted the common sense of ordinary people–white and Latino, Democrat and Republican–against the timid political elites of all these groups, unwilling to challenge the special interests that benefited from a failed system. Our message to the media was populism without xenophobia, and it resonated widely. Every poll or news story highlighting the widespread Latino dislike of bilingual programs helped reassure moderate and liberal whites that our measure was not anti-minority, while simultaneously persuading conservatives that Latinos and other immigrants shared their own basic values and assimilationist goals. But there was also a countercampaign, which in resources and funding could hardly have been more dissimilar to our own. Our statewide effort consisted of just three full-time workers, myself included, together with a handful of volunteers whose main role was to participate in public debates and respond to media inquiries. By contrast, “No on 227″ was a traditional, well-funded operation led by ace Democratic political consultant Richie Ross and a veteran campaign staff, backed by a field operation of thousands of local activists. It counted the public support of President Clinton, the chairmen of both the state Republican and Democratic parties, all four candidates for governor, every educational organization, every public and private union, and nearly every newspaper. Our opposition was to spend millions on a coordinated barrage of radio, television, and print advertisements; our own campaign was forced to rely almost entirely upon stories in the free media. Still, despite this monumental imbalance, our foes faced challenges of their own. From the start, public opinion had overwhelmingly and consistently favored “English for the Children” across all ethnic and ideological lines. Although “No on 227″ boasted the support of a coalition of pro-bilingual partners, any direct defense of bilingual education was out of the question: nearly everyone knew that the existing system was a failure. No more feasible, given the pro-immigrant credentials of Proposition 227’s main backers and strong immigrant support in the polls, was any attack on the measure as mean-spirited or 187-like. Indeed, such a tactic, by creating an ethnic divide over the measure, might actually backfire by solidifying white support for it. THE ULTIMATE strategy chosen by the anti-Proposition 227 forces was breathtakingly cynical. This coalition of Latino activists, Democratic operatives, and educational organizations attempted, 187-style, to provoke a white taxpayer backlash by portraying the measure as a huge government “giveaway” to immigrants because of the extra money earmarked to assist adults in learning English. (The entire sum of $50 million amounted to an annual $1.50 per Californian.) Simultaneously, a completely different advertising message, aimed at California’s Latino audience, claimed that the problems with bilingual programs had recently been fixed and that Proposition 227 would actually prevent children from learning English in school. These nakedly dishonest tactics shredded the credibility of the anti-227 campaign, which received a further blow when its major financial backer was discovered to be A. Jerrold Perenchio, a Republican billionaire and close ally of Governor Wilson. Not himself Latino or Spanish-speaking, Perenchio derived his fortune from his ownership of Univision, the Spanish-language television network, and thus had an obvious economic motive in preventing Latino children from learning English in school. Not only did Univision blanket California with anti-227 “advertorials,” broadcast free of charge, but the leading Democratic and Republican candidates for governor counted Perenchio as their largest financial donor, and all of them starred in Perenchio-funded anti-227 commercials. When voting day finally arrived, Proposition 227 passed in a landslide, gaining 61 percent of the vote across ethnic and ideological lines. True, the “No” advertising campaign, which outspent our “Yes” campaign by about 25 to 1, took its toll, reducing by over a third the 62-percent Latino support the initiative had enjoyed before the start of the television barrage. But since advertising campaigns merely rent support rather than buy it, Latino backing for Proposition 227 in post-election polls soon returned to its earlier levels. More importantly, the actual dismantling of bilingual-education programs in the wake of 227 proceeded with minimal Latino opposition anywhere in California. Under the measure, parents who wish to place or keep their children in a bilingual program can apply for a waiver, but few have done so. Within months of the vote, the number of students in bilingual education had fallen to about a tenth of its previous levels, and numerous follow-up stories in the press have featured glowing accounts of parents thrilled that schools are finally teaching their children to read, write, and speak English. There have been almost no signs of the immigrant unhappiness or resistance to English-language classrooms that had been confidently predicted by ethnic activists and anti-immigrant ideologues alike. Proposition 227 had tested the case for a return to assimilationist policies in public education and had proved it both popular and workable. THREE RACIALLY-CHARGED issues, with three different contours and consequences. What is their meaning for our national future? Since before the Declaration of Independence, the “American Dilemma”–to borrow the title of Gunnar Myrdal’s classic 1944 work–has indeed been that of race, and it has cast a huge shadow over our entire political life. But that dilemma has had clearly circumscribed limits: namely, the longstanding coexistence and conflict between a (usually poor) small African-American minority and a (usually less poor) large European-American majority. This framework was constant throughout our history, from Jamestown through the Civil War to the civil-rights era of the 1960’s, and even today it completely dominated the thoughts of those who led President Clinton’s National Commission on Race. Until recently, those aspects of the American experience that did not fully conform to this bipolar, black-white paradigm were either squeezed into place or overlooked with little effect. Thus, tens of millions of penniless European immigrants around the turn of the century were initially viewed as “aliens of a foreign race” but, through the ideology and the reality of the American melting pot, were transformed into “whites” within a generation or two. Relatively small populations of “others”–Asians in California, American Indians throughout the country–were either assimilated into mainstream society or generally ignored as distinct American racial groups. And, as we have seen, Hispanics were not even classified separately from other Caucasians prior to the 1970 census. In many respects, the civil-rights/Great Society era of the 1960’s represented the culmination of this vision of America. A shamed but wholly dominant white society created a cornucopia of social-welfare and social-engineering programs (Headstart, busing, affirmative action), largely aimed at blacks and intended to serve as partial atonement for the legacy of slavery and Jim Crow while easing black entrance into the American dream. But the ideology that evolved to justify these programs also radically changed the terms of the American social compact, replacing the emphasis on assimilation with an emphasis on ethnic difference. Two further events occurred simultaneously with the completion of the old American racial agenda, and they drastically magnified the impact of this ideological change: the passage of the 1965 Immigration Reform Act, which reopened America to large-scale immigration after a 40-year hiatus, and, as a direct consequence of affirmative-action politics, the creation of the Hispanic racial category. Over the past 30 years and at a growing pace, more than 25 million new immigrants–80 percent of non-European origin–have entered America, and they and their descendants now constitute a rapidly growing fraction of our total population. Well over half of these new immigrants have been Hispanic, and this ethnic group–today defined in racial terms, with all the attendant special treatment under official government policies–will by itself represent between 20 and 25 percent of America by the middle of the approaching century, at which point Americans of European origin will have become a minority of the population. A future America in which both whites and all other ethnic groups see themselves as minorities will be far different from our traditional majority-white/minority-black society. Since the 1960’s, the deepening ideological decay of the American melting pot, especially among the journalists and intellectuals who shape our thoughts, has transformed our official self-image from that of a nation of individuals living in a common culture into that of a nation of groups arrayed against one another in an ethnic spoils system. Multiculturalism and “diversity” thoroughly dominate our nation’s schools and politics and public discourse, encouraging minorities to exercise influence through the mobilization of ethnic or racial grievance. Under this framework, the rise of a similar ethnic-grievance movement among America’s emerging white minority is likely, perhaps inevitable. Already there are early warning signs of such a movement. Public schools are reporting interest in white student clubs, and white firefighters associations and European-American pressure groups are forming in California. Although so far these developments and others like them are minuscule, and the individuals involved make every effort to avoid even a hint of extremism, evolving white-bloc politics could eventually develop a white-nationalist orientation or fringe. Elements of white nationalism have been the unspoken subtext behind the rise of extremist militia groups and the appearance of populist third parties, and represented the obvious core of the anti-immigration movement of the mid-90’s. AS THE first major state to face the political reality of a shrinking white minority, California has become the laboratory of America’s ethnic future. The verdict of its recent experiments is a mixed one. From the distance of five years, the raw emotions evoked by Proposition 187 may seem as if from another world. Not only has the initiative itself died a lingering death in federal court, but the subsequent, far more moderate 1995 federal legislation that it inspired, removing various social-welfare benefits from legal and illegal immigrants, has also largely been repealed. And where Democrats like Dianne Feinstein once worked hard to outdo Pete Wilson in anti-immigrant fervor, now Republicans like George W. Bush work no less hard to showcase their facility with the Spanish language. In part, this change is surely traceable to our transformed economic and political landscape. During 1994, America was facing difficult economic times, and California in particular was struggling through its deepest recession of the century; today we are in the midst of a seemingly endless boom, led by California’s high-tech economy. In addition, political movements targeting immigrants have had the unintended consequence of generating an unprecedented wave of naturalization and voter registration among Latinos and Asians, with these groups doubling their share of the California vote between 1990 and 1998. Politically vulnerable communities are no longer so politically vulnerable. But surface appearances are deceiving. Underlying social dynamics, whether in California or in the nation at large, have not changed, and ethnic conflict, temporarily submerged, has far from disappeared. To the contrary, given the nature of the demographic processes now at work in the country, the potential for such conflict is growing rather than diminishing, and any sudden crack in our unprecedented economic prosperity might well be the occasion for its revival. This need not occur. The overwhelming evidence is that today’s immigrants are at least as economically productive and socially assimilative as their European predecessors, with low rates of crime, welfare dependency, and social instability. Asians have followed the pattern of high academic achievement and economic entrepreneurship exhibited by America’s Jews before them, while Latin American immigrants have demonstrated much the same social conservatism and working-class values as Italians or Slavs. (One remarkable sign of their assimilationism is the high rate of conversion to evangelical Protestantism among Latin American immigrants.) As the campaign for Proposition 227 proved, today’s immigrants are no less eager than yesterday’s to have their children merge into our English-language society. Most significantly, nearly 40 percent of third-generation Asians and Latinos are intermarrying, usually with whites, a figure far greater than the intermarriage rates of Italian-Americans or Greek-Americans with other ethnic groups as late as the 1950’s. It is therefore a tragedy of the first order that, even as the reality of the American melting pot remains as powerful as ever, the ideology behind it has almost disappeared, having been replaced by the “diversity” model and by the politics of grievance. A social ideology that allots to blacks and Latinos and Asians their own separatist institutions and suggested shares of society’s benefits cannot long be prevented from extending itself to whites as well, especially as whites become merely one minority among many minorities. Before it is altogether too late, those who support this status quo must realize that the diversity prescription contains the seeds of national dissolution. America today stands as one of the very few examples in history of a large and successful multiethnic society. If we are to continue and extend our success–which is hardly foreordained–we can only do so by returning to the core principles of Propositions 209 and 227: ethnic assimilation, and individual equality under the law. Otherwise, we face the very real threat of future movements along the lines of Proposition 187, each worse than the last, and on a national scale. There are few forces that could so easily break America as the coming of white nationalism. * The fault line between native-born and immigrants in California paralleled almost precisely the line separating whites and blacks on the one hand from Asians and Latinos on the other, thus heightening the racial character of the immigration issue. This was not (and is not) the case elsewhere. New York, for example, was second only to California in its concentration of legal and illegal immigrants, and suffered from even greater economic and welfare problems. But for a number of reasons, including the much more variegated makeup of New York’s illegal immigrant population, which numbered multitudes of Irish, Italians, and Africans in addition to Asians and Latinos, attacks there even on illegal immigrants never much entered the portfolio of Republican-party leaders. Even at the height of the immigration wars, New York City Mayor Rudolph Giuliani defied national party leaders by publicly defending his city’s population of undocumented residents. A measure like Proposition 187 was a complete nonstarter in New York from day one. Ron Unz, here making his first appearance in COMMENTARY, has written on public policy for the Weekly Standard, the Nation, the Wall Street Journal, and other publications. A Silicon Valley entrepreneur, he was the author of California’s Proposition 227, the “English for the Children” initiative to dismantle bilingual education, which passed in 1998. This entry was posted in Bilingual Education, Immigration/Race, Published and tagged Bilingual Education, Commentary, Cover Story, Immigration/Race, Major Item. Bookmark the permalink.